The 1950s were rife with futuristic, modern design. One type of accessory that followed this wave is the Lucite handbag. These purses are avidly sought by vintage enthusiasts, and prices have held their own in the marketplace over the past five to ten years as prime examples are getting harder to come by. A number of these bags sold during a Morphy Auctions live webcast auction in December of 2015. This bag is marked Llewellyn, one well known maker of Lucite handbags in the 1950s. The color, gray marble, is not uncommon but the angular shape is a bit out of the ordinary. Sold for: $231.50 (not including buyer’s premium) at Morphy Auctions in December of 2015). Larger than most, this purse is crafted of beautifully swirled copper-colored Lucite squares. It also exhibits that nice examples in excellent condition can bring good prices whether or not they are labeled by the maker. Sold for: $396.50 (not including buyer’s premium) at Morphy Auctions in December of 2015). Marked Gilli on the hinge, this example also features gray marble Lucite but with the addition of confetti mixed into the plastic making it more desirable. The ball feet also add design interest to this purse. Sold for: $244 (not including buyer’s premium) at Morphy Auctions in December of 2015). This bag is marked Tyrolean NY inside the purse. It is made of black Lucite in an uncommon shape with rhinestone embellishment on the top. Minor wear and soiling to the handle on this example. 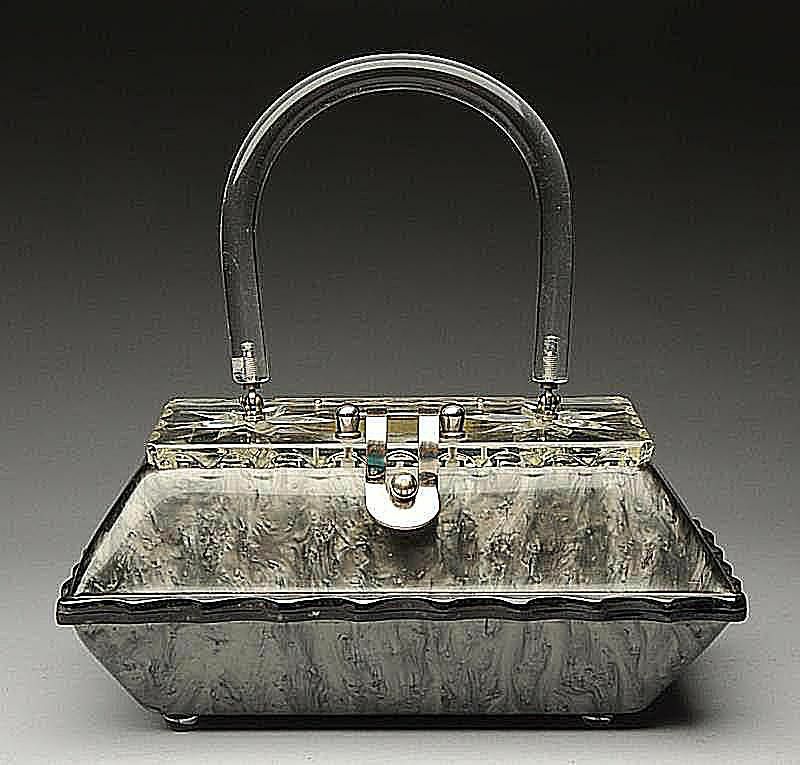 Another Llewellyn example dating to the early 1950s, this handbag is made of amber-colored Lucite (sometimes confused with Bakelite due to the color), a bit of a departure from the usual white, clear and gray so often seen in these bags. The shape is a bit out of the ordinary as well. It is marked with the manufacturer’s name on the hinge. Sold for $213.50 (not including buyer’s premium) at Morphy Auctions in December of 2015). Marked with Kahn label inside, this example was produced by Charles Kahn, another company known for its Lucite purses. Estimated to date to the mid- to late-1950s. The brushed metallic bold body is a bit unusual in color, although the shape of this bag is quite traditional. Sold for $244 (not including buyer’s premium) at Morphy Auctions in December of 2015).